Roar is a single by Katy Perry from her fourth studio album, Prism released in 2013. Perry performed with Roar at the 2013 MTV Video Music Award. Roar was nominated at the 56th Annual Grammy Awards as the Song of the Year and for the Best Pop Solo Performance. 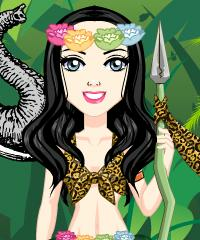 In this Dress Up Game you can Dress Katy Perry Up in a jungle fashion style and bring out the trendy fashion tiger in her.